Do you get a bit frazzled preparing for conferences? Parents have a million questions and you have 10-15 minutes to explain 10-20 weeks of progress. I used to stress about where to begin the conversation. Then I figured out how to make it visual so I had less explaining to do. Read more to see how I organized my student portfolios to show growth and mastery of Learning Goals and Scales. If you’re evaluated using iObservations or the Marzano Framework, this will support your Domain 1 requirement. This bit of feedback from Tonya who is using the 4th Grade Common Core Math Assessment with Learning Goals and Scales, just reminded of those days when I sat through 30 plus conferences trying to explain in 10-15 minutes what we’d been working on for the last 5 months, and how their child was doing. Until I started using my Student Portfolios I didn’t have a simple tool to help you communicate student progress with students, parents, administrators, and other teachers. Six years ago I was working at a Title I elementary school as a gifted resource teacher 75% of the time, and a reading interventionist 25% of the time. Talk about different spectrums! Luckily for me I worked with small groups, but since my students came from five different grade levels, and there were at least 3 teachers for every grade level, communication meant a lot of data and meetings! Ugh. I’m one of those weird teachers that found staff meetings to be fun because I got to talk to other teachers! But, data meetings – definitely not fun. Lots of numbers next to each name, but no examples of student work to help understand the fine details that could shed light on why each child was performing at their own level. It seems that with all of the inclusion, clustering, interventions, and enrichment programs being implemented, most classroom teachers have a whole team of co-workers to share students with. This means that communicating about student progress doesn’t just happen a few times a year, but possibly every week! How nice would it be to have one organized place to display student performance data that explains itself! 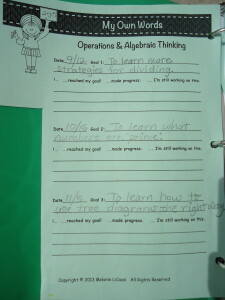 The Math Assessments with Learning Goals and Scales plus the free Student Portfolio Pages that go with each grade level, were created to be a visual tracking aid for documenting student progress in a really simple and consistent way. Click on the video link below to flip through the 4th Grade Portfolio Sample that Tonya used for parent-teacher conferences. Visit my FREEBIES page to try them out for yourself first. Grades 3-8 are available now. Check out the work samples below! Tracking Marzano scales is not as hard if you have a simple visual system for documenting student progress! 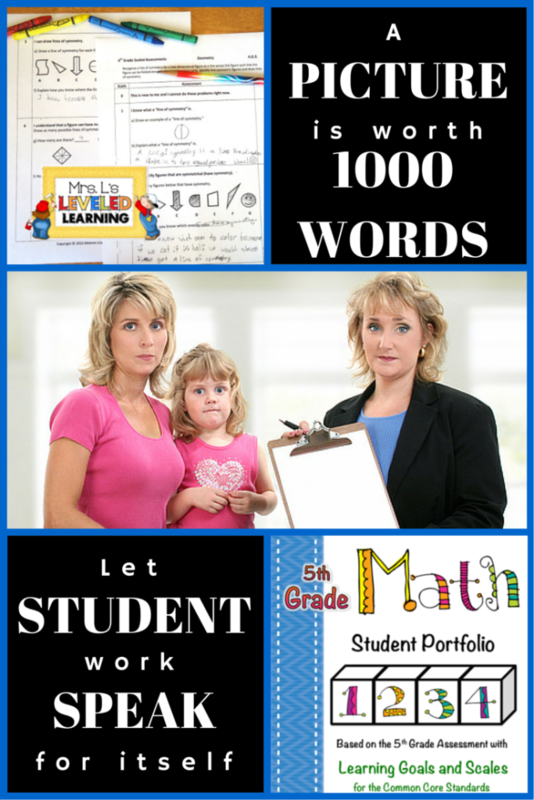 Student Portfolios make it easy! Tracking student progress used to be the teacher’s job. Research has shown that students make more progress and can take ownership of their learning when they track their own progress. How does that work and who has time to fit one more routine into the classroom? When I taught a multi-age class, it seemed daunting to have to track progress from pre-assessment to post-assessment. Where was I going to put all of these papers, how was I going to keep track of them, and how could I give my students access to them as well? Well, I like to keep things simple and visual or I will never remember to follow through with it! So I created a simple form where my students could color in boxes to show their pre- and post-assessment mastery for each scale. The pages work as binder dividers. The front side has the coloring pages that we do as soon as I pre-assess the kids. The pre-assessment scores are not “grades” that count towards their average, but just starting places. 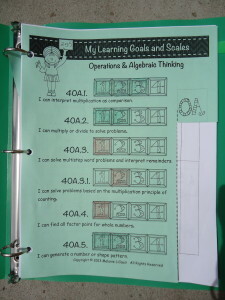 The kids can then write goals on the back side. Goal-writing is hard at first, so I give my students prompts. You can find these FREE pages for elementary and middle school students at my TpT store. Each document includes prompts to get the kids started. 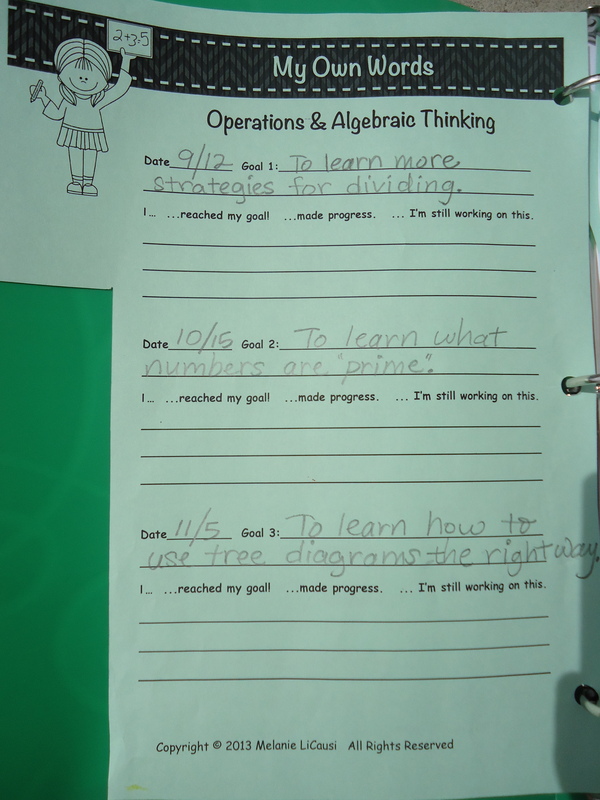 Early elementary students can start by writing one goal per cluster. After you teach your units and give the kids their post-assessments, then the grades count! I like to color code things, so I have them color the post assessment results differently so their progress stands out. Yes! Sometimes kid’s learning is not linear and they will not have mastered the levels in order. The important thing is to document their starting and ending places honestly and provide instruction where necessary to get everyone to at least a level 3 by the end of the year. After the post-tests are scored, the grades go into my grade book, and the pages are returned to the students so they can see how they did. They use their graded test to color their final box, write their reflection, then file their paper away in the binder. If your students struggle with written reflections, they can simple circle one statement to indicate their progress. “I…reached my goal!” “I…made progress.” “I’m still working on this.” Easy! 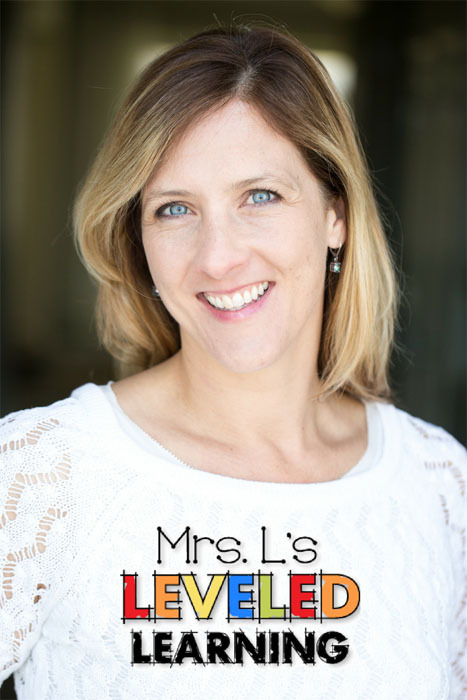 For examples of Assessments that make the scoring process easier, visit Mrs. L’s Leveled Learning FREEBIES or TpT Store.